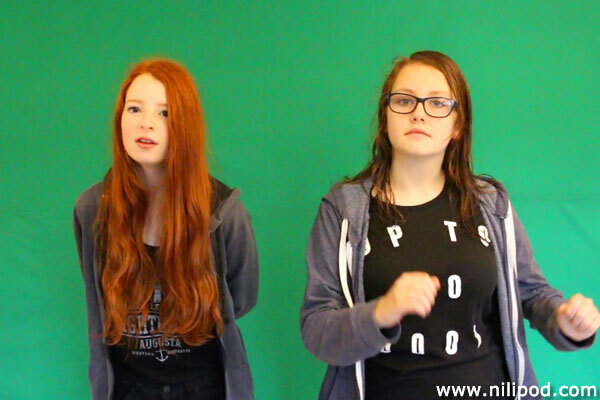 Here's another photo of us dancing in front of our green screen, in between takes for a YouTube video that we were recording. If music is playing, it's difficult not to get into the groove and start dancing. We use the green screen from time to time, to make silly videos where we want to swap out the background for something else, maybe animated question marks for a Questions and Answers video, or flashing lights for some disco dancing. We try to light the screen well for the best results when it comes to editing, using a combination of natural light and reflector screens, and some studio lights. If you want to buy a green screen yourself, then eBay is definitely a good place to find one, although your local fabric shop or market will probably be able to sort you out. Make sure that the material is not too reflective and choose a brighter shade, rather than a darker one, and if a crease-free option is available, all the better. And when you pack it away, it is best to roll it, rather than folding it.